A busy day, with more YAC members joining the muddy fun. 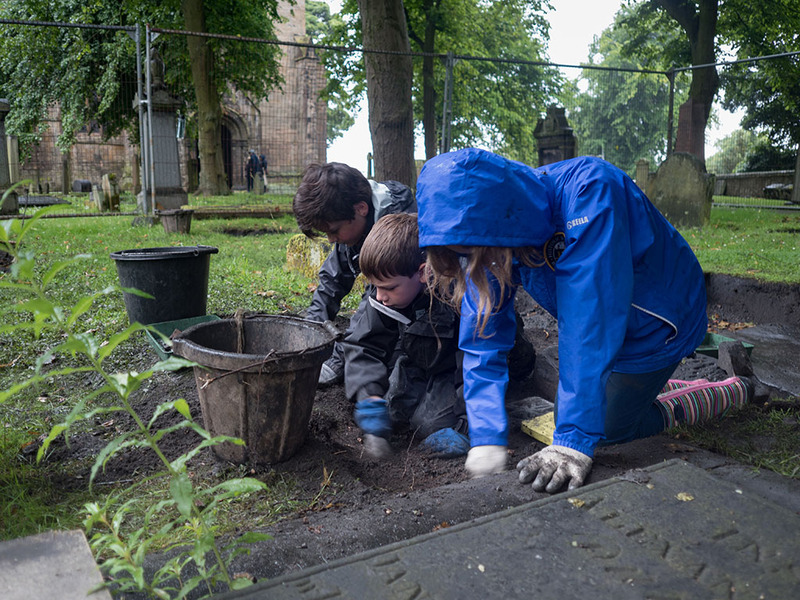 To be fair, dust was more of a problem this time as Erin, Katy, Alexander and Kathryn all got on with cleaning our prettiest gravestones with toothbrushes and toothpicks. I’m sure Erin was muttering something about having been cleaning for ten hours now. It has to be said though, the stones are probably looking their best for the best part of a century, if not longer. We now think that the date 1712 sits above the coat-of-arms, which itself seems to contain a mason’s set square. The wee stone that Alexander and Naomi worked so hard on yesterday turned out to be a blank. Alexander and Olivia cleaned up the face of the stone, but, as you can see, there is no sign of surviving inscription. We flipped the stone over, but the reverse side proved to be quite rough and devoid of any carving. Olivia, Katy, Dougie and myself worked on a new, long trench just south of the wee stone. We all found a lot of burnt material that included coal, charcoal, ash and what looked like bits of slag. We found several distinct patches of burnt material where it had been dumped. 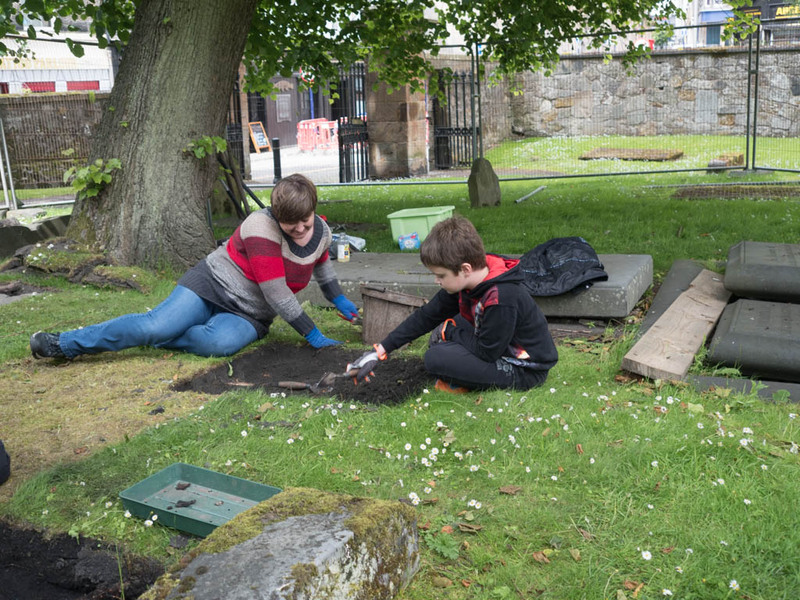 Even more exciting, Olivia and Dougie had a go with the probe and located a new gravestone, which Alexander and Olivia made short work of uncovering. As you can see it is a fairly small stone, but with names inscribed on it. The top name is still slightly hidden, so the next job will be to extend the trench slightly to the west. 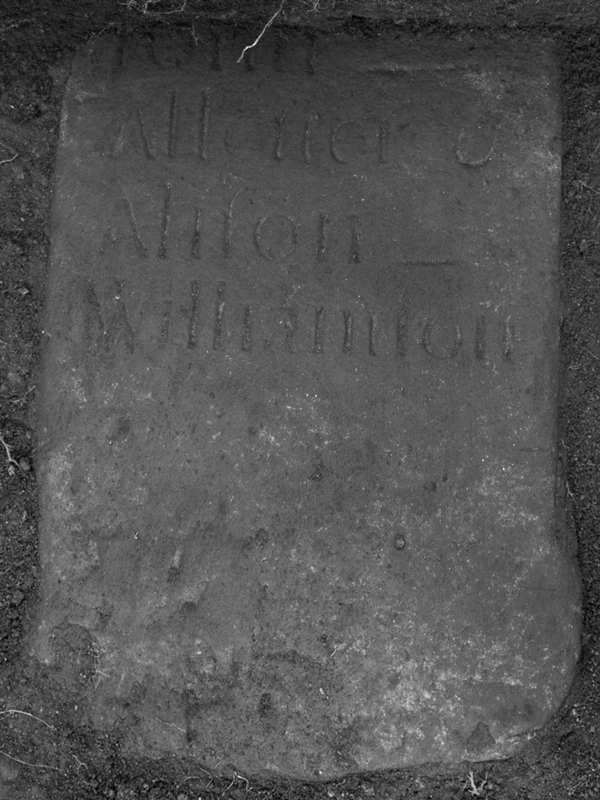 We think the bottom name is Allison Williamson, but can’t yet make out the name above very clearly. Let’s hope for a date too. We have been so fortunate with the weather this week. Dry, warm weather with a bit of a breeze dries out the gravestones we have revealed and gives us a chance to get them nice and clean. Only then can we see fully any surviving inscriptions and other carving. Be that as it may, it gets a bit hot when you are deturfing and backfilling. Dougie and I did a far bit of that this morning while the YAC members got on with the interesting work. Alexander and Naomi uncovered the stone that we found last thing yesterday. 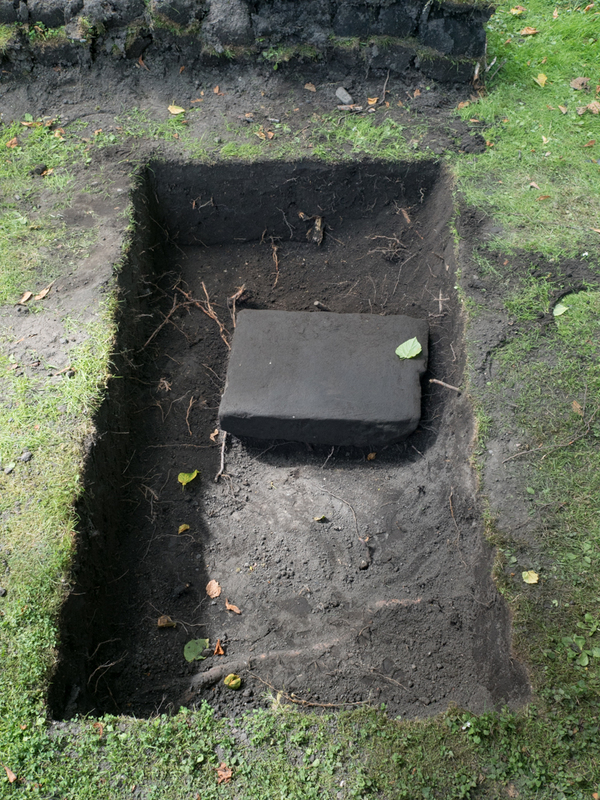 I was expecting a mighty stone that had once stood tall in the graveyard, so I had extended the trench accordingly. What was uncovered was actually quite petite. The master diggers made excellent progress over the day. Alexander was a bit reluctant to leave, even when I promised not to look at the other side of the stone until he arrives tomorrow. As you can see, the upward face is quite smooth. Tomorrow we will lift it to see if there is any inscription on the other side. Fingers crossed. 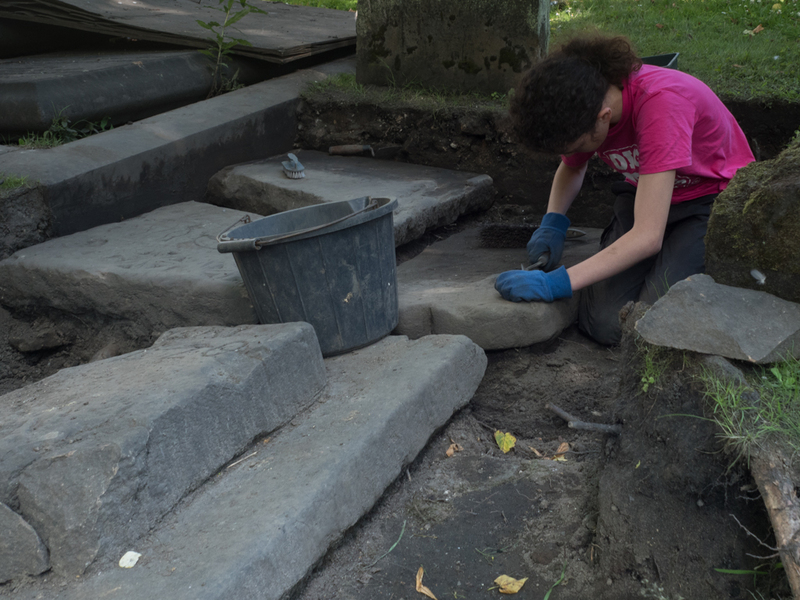 Meanwhile in the “Trench of Many Stones”, Erin was getting on with tidying up so that the edges of each stone can be seen clearly. This is painstaking, but not terribly exciting work, but the results make it all worthwhile. Erin didn’t even want to stop for lunch, so the rest of us just watched her, munching our sandwiches. 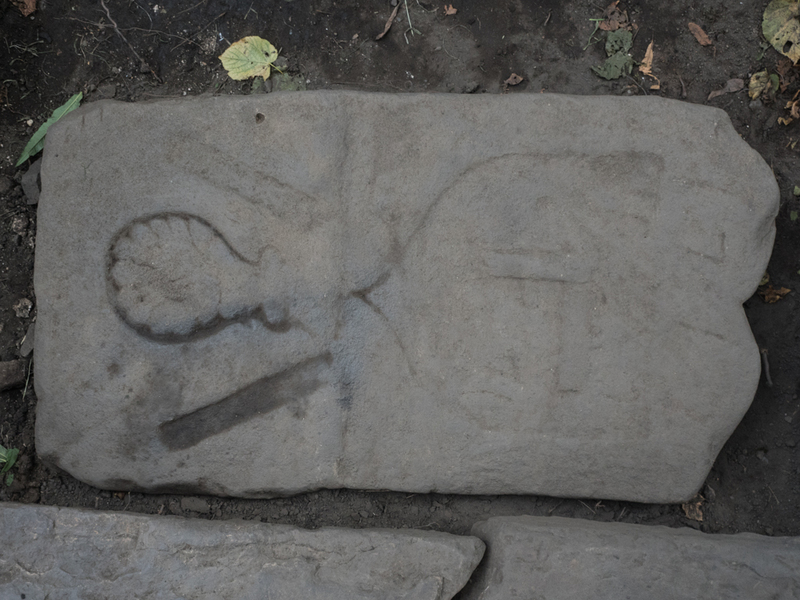 She did have her lunch eventually, after which she got on with carefully clearing the mud off our coat-of-arms stone and starting to reveal some detail that had not been before. 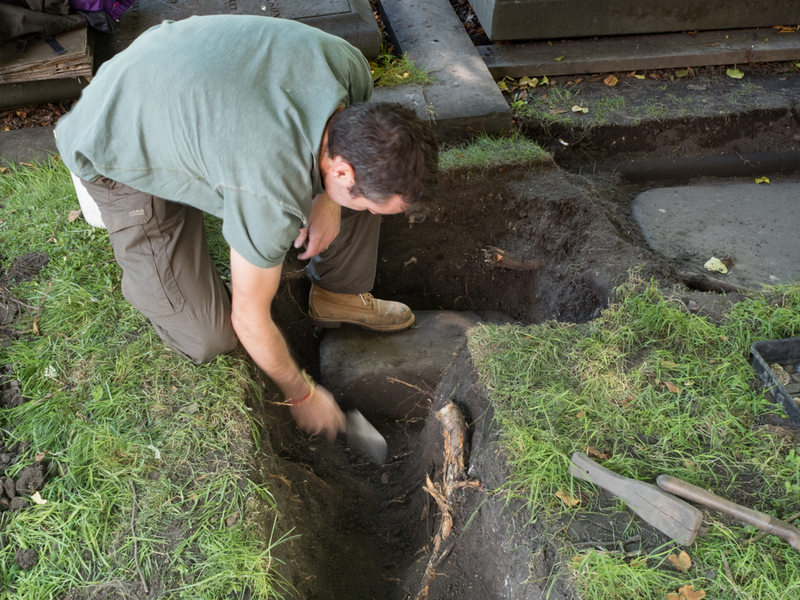 Meanwhile Dougie was working away in his own private DHCP trench, uncovering a stone that is small, very thick, at a difficult angle and partially obscured by thick roots (until this afternoon). Again there is no inscription on the upward face, but we should be able to flip it eventually to see what lies on the hidden side. Dougie practising his speed trowelling. A lovely warm day to spend in a graveyard, beneath the shady trees, grubbing for gravestones around their roots. No wonder there were so many of us on site today. Members Alexander, Kathryn, Finlay, Erin and her big brother Kieron were all working on site today. 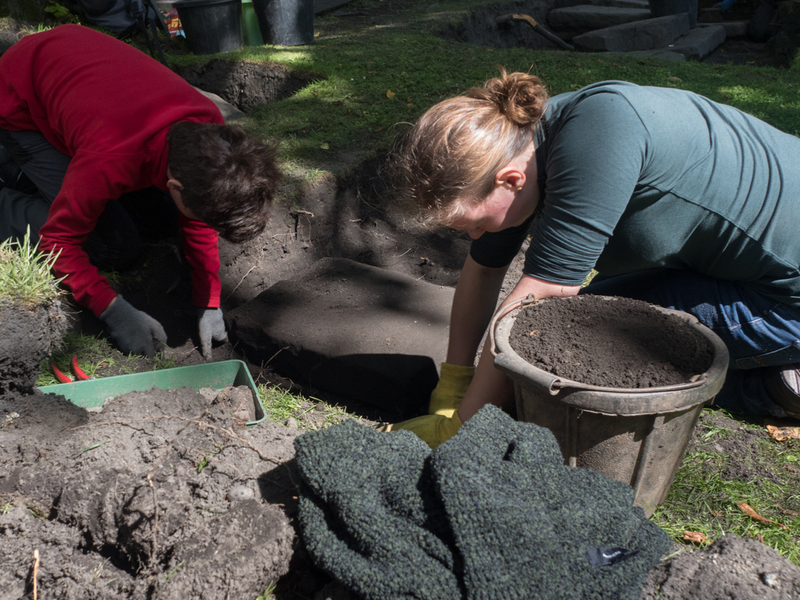 Most of the team focused on clearing the earth around the stones we had already discovered. 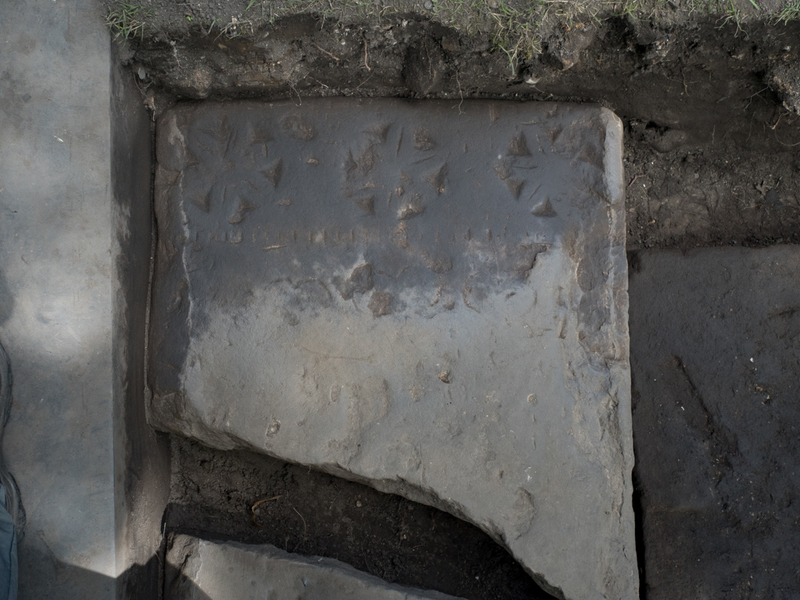 Kathryn and Finlay uncovered the rest of the fragment of stone that lies below the shoemaker’s stone and discovered that it has the same flower decorations near the unbroken edge. 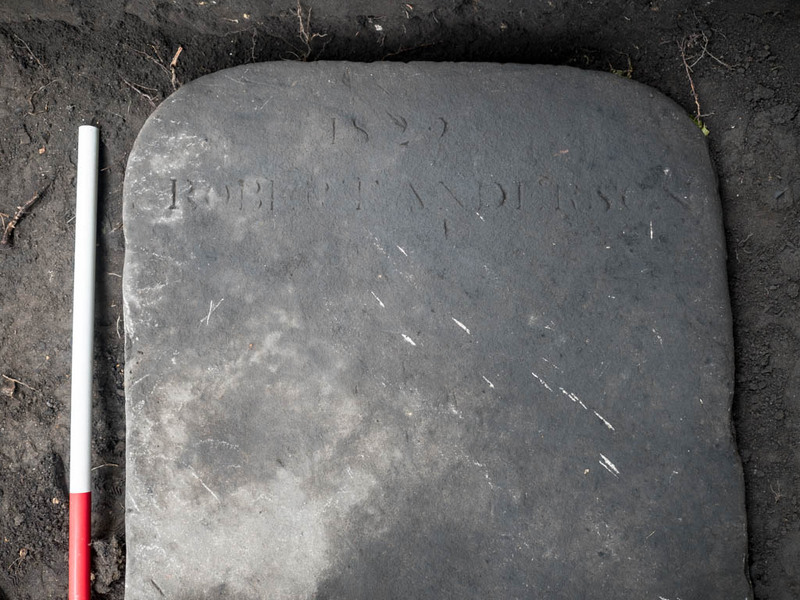 Two fragments of gravestone. Are they two halves of the same stone? So were they part of the same stone? We originally thought that they were, but then the difference in the shape of the breaks on each piece made us wonder if they were just two broken gravestones. 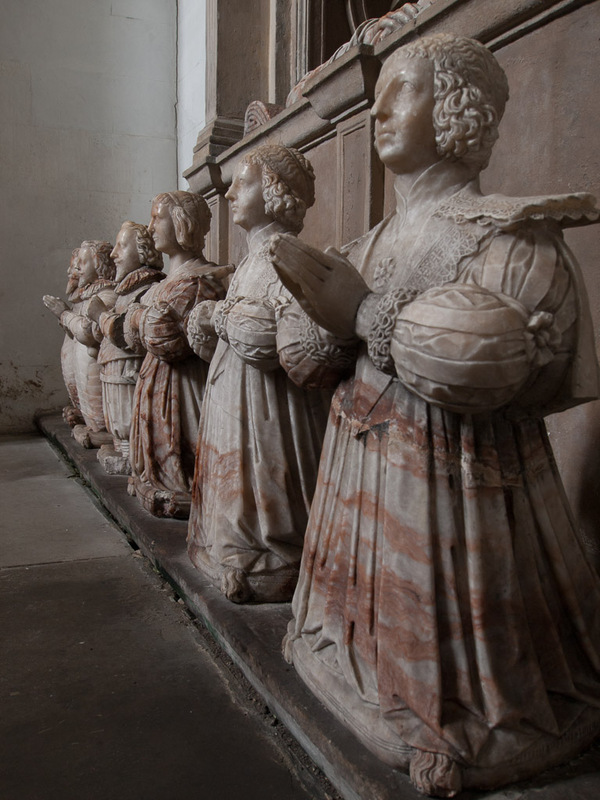 Finding the same decoration on each makes it more likely that they were once part of the same large stone. If they are parts on a single monument, then it must have always lain flat on the ground, otherwise some of the flowers would have been buried in the earth. Tomorrow we will be able to clean the fragment we uncovered today and discover if anything else has been inscribed on it. A name or two would be an exciting discovery, but we shall have to wait and see. 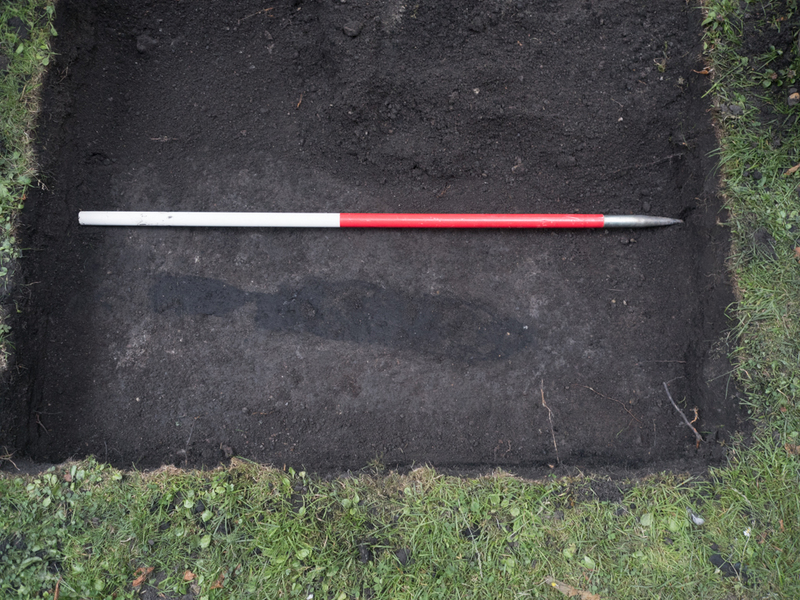 Meanwhile, Alexander and Kieron were excavating another 1 m x 1 m test trench to the west. Alexander used the probe first to see if there were any signs of gravestones lower down. The probe was inconclusive, so they excavated anyway. Alexander using the probe in one of the test trenches. Little did Alexander know, but there is a gravestone just a few cm away from where he was probing. The first 10 cm or so was soil with some pottery and stone inclusions. Below that they started to hit areas of burnt material, probably from coal fires in peoples’ homes, and rubble. After Alexander had gone home, Kieron and I were just tidying up the sides of the trench when we suddenly found this, disappearing into the west side of the trench. So, another stone for tomorrow. It makes me wonder if we have just missed any other stones beyond the trench edges. 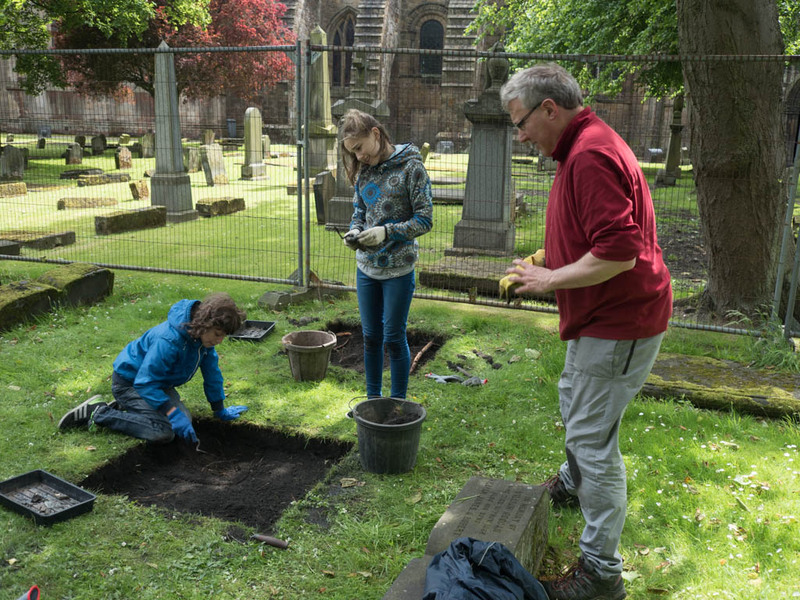 Meanwhile Erin’s dad, Dougie, was digging a new trench for DHCP (Dunfermline Heritage Community Projects) and apart from some nice pieces of glass and pottery, he too found the end of another gravestone. 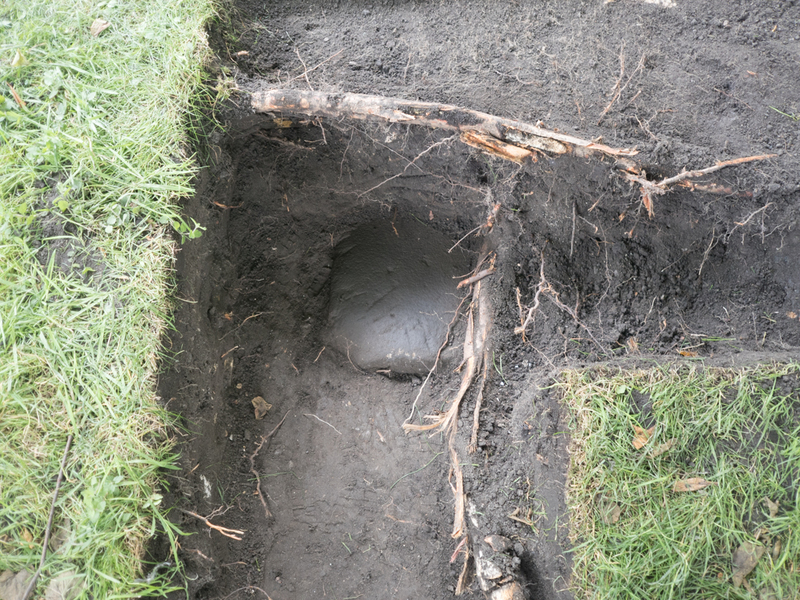 If you think the root is impressive, have a look at the photo below of another DHCP trench on the site. Once again we can see how discarded fragments of stones have been used as infill. Notice the curb running along the left side of the trench. It might related to the large flat stone at the bottom of the trench, but until more has been excavated it isn’t possible to be sure. We got back to work on Friday 22nd July after a two week break. 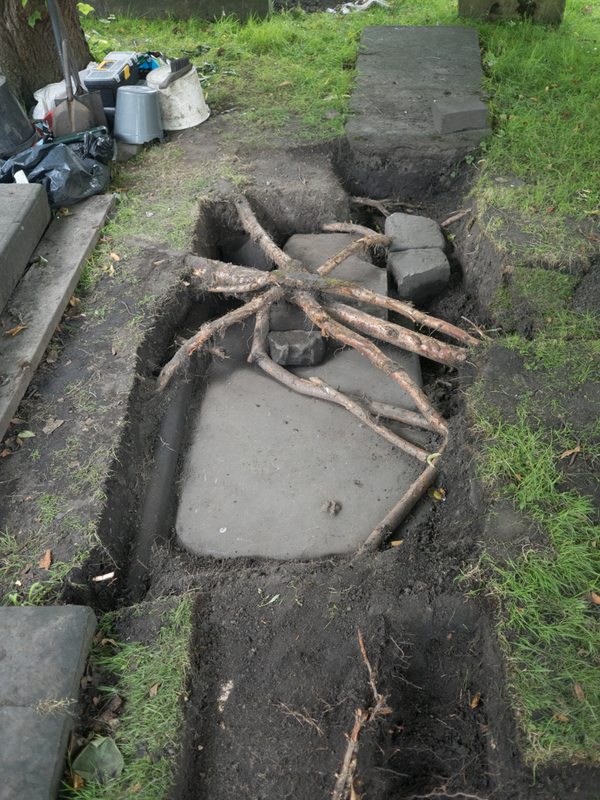 Well Dougie and Erin had worked on exposing more of the gravestone that we had just uncovered a corner of, more of which below. On Friday Alexander, Kathryn and Lee turned up for a jolly time in the mud. The morning wasn’t too bad: the rain was light and we were sheltered by our tree, despite the fact that we keep hacking away (carefully and no more than necessary) at it’s roots. 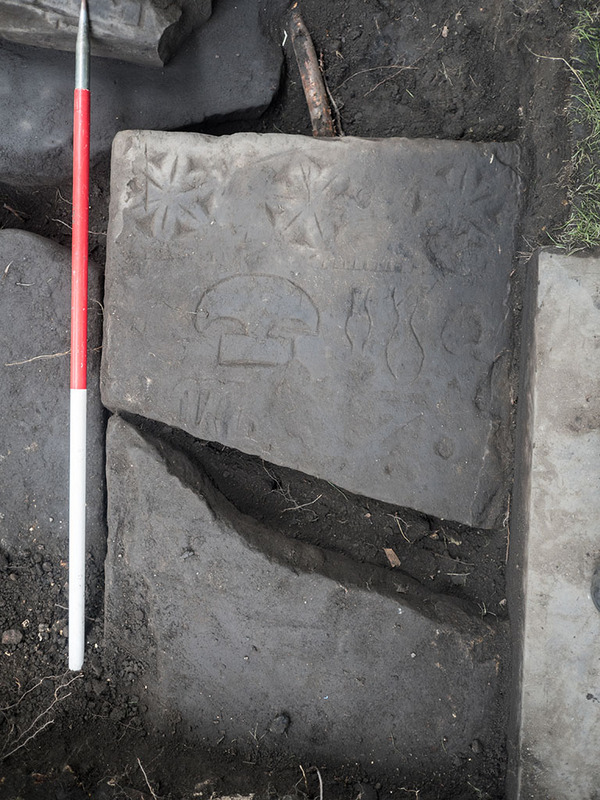 We uncovered more of the stone that Dougie and Erin had worked on and even found another next to it that has a very worn coat-of-arms. The afternoon was pretty grim. The rain came down hard and dripped onto us through the branches. Small puddles started to form in the bottom of the trench. We got very, very muddy. Alexander was worried that he wouldn’t be allowed on the bus home (he was), Kathryn’s hair straggled and Lee was just very happy. 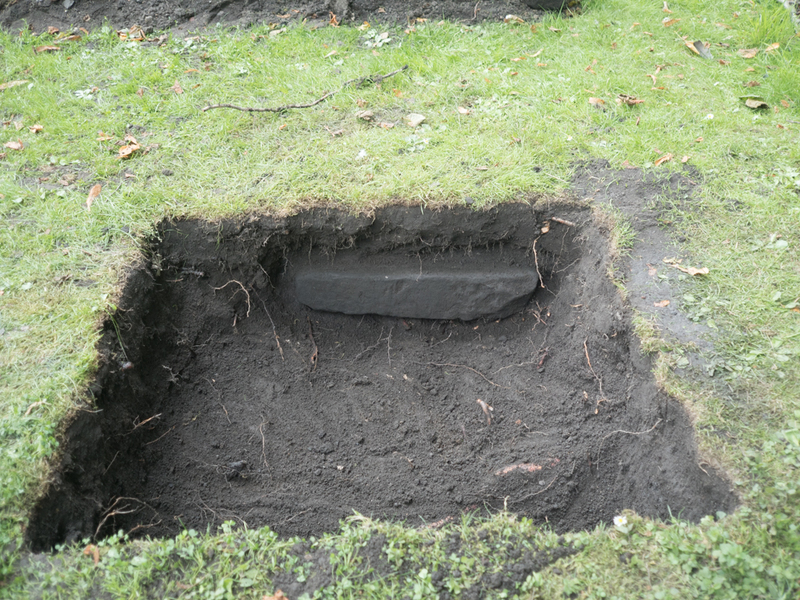 Kathryn probed the bottom of the test pits that had so far revealed no gravestones, and found not a sausage (or gravestone). Lee sifted through the spoil heap for finds that we had missed (he found some nice decorated glass and clay pipe fragments) and the lost city of Atlantis. Alexander worked on uncovering more of the new stone. This was Lee’s first go at excavating and he did really well. He quickly developed a good trowelling technique and has a sharp eye for small finds. Saturday was an altogether kinder day to us, dry and pleasantly warm. Yesterday’s puddles had dried, the muddy stones could be cleaned up. 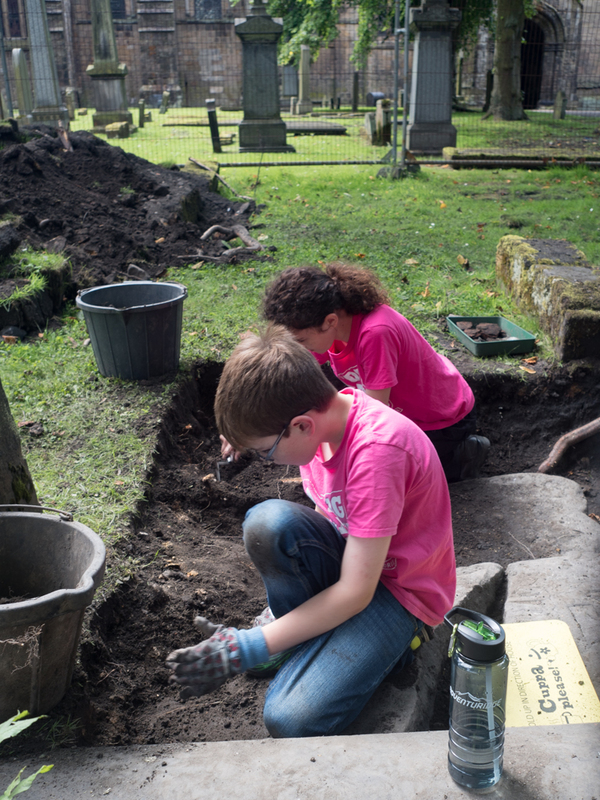 Three YAC members came along to dig: the stalwarts Alexander and Kathryn (though she sneaked off early) and Olivia. 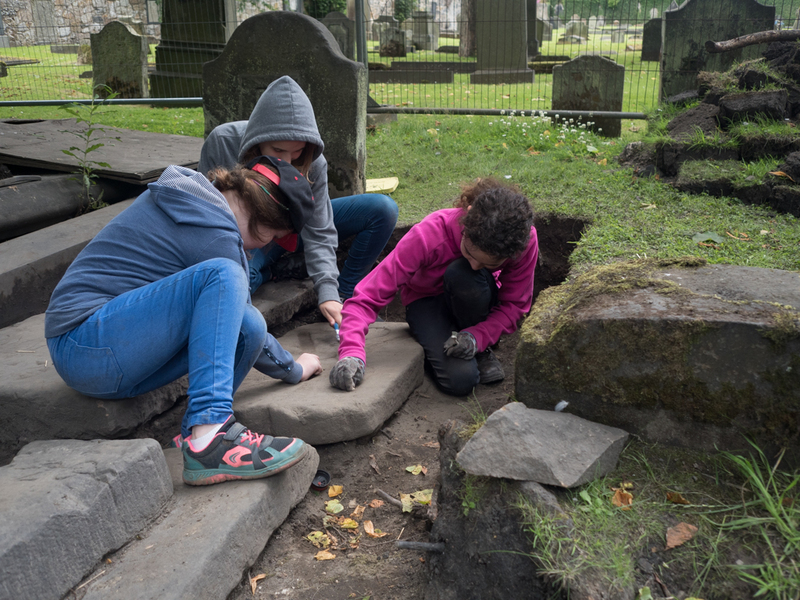 We got on with uncovering and cleaning gravestones, tidying up the trench sides, probing for more stones and finding teeth (Olivia found very nearly a whole mouthful). 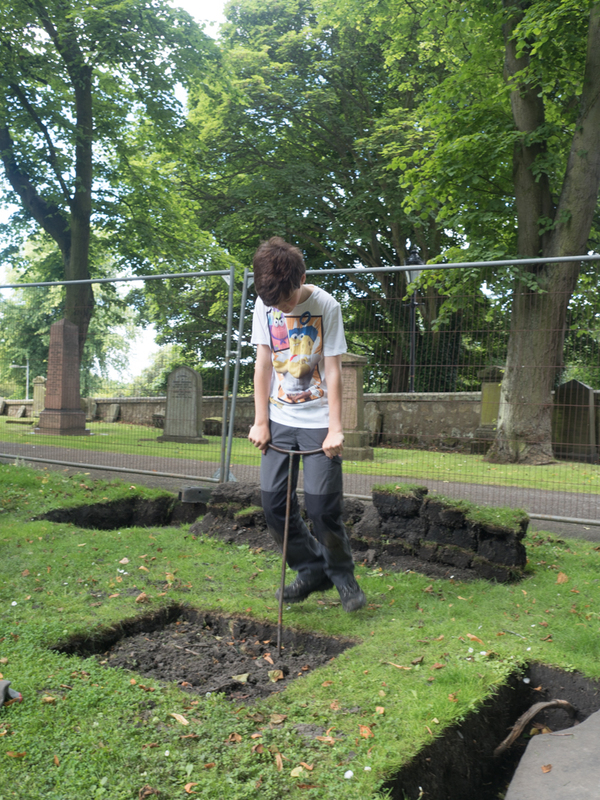 We also mad a start on backfilling the barren test pits to the south of the trench with all the gravestones. Alexander sitting around letting everyone else do the work, as usual! We had a good number of visitors to the site. We often get asked what we are doing. 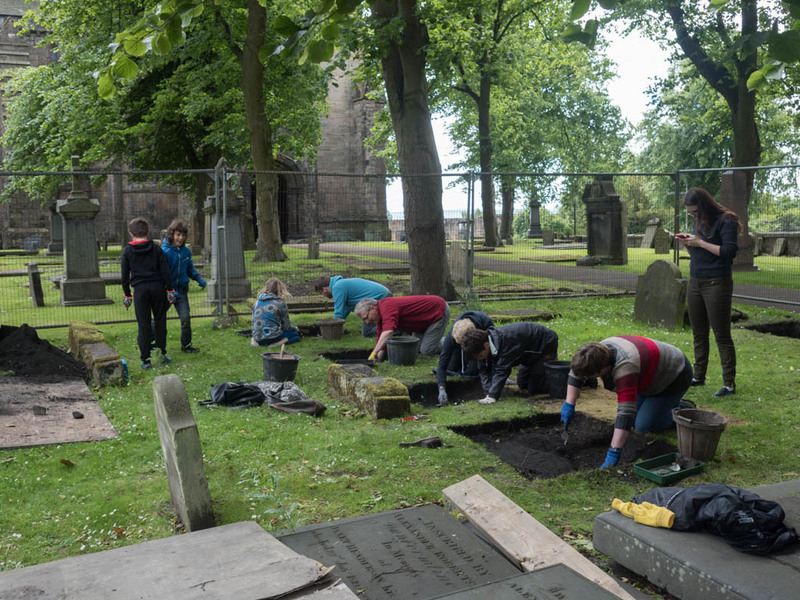 Are we robbing or repairing graves? 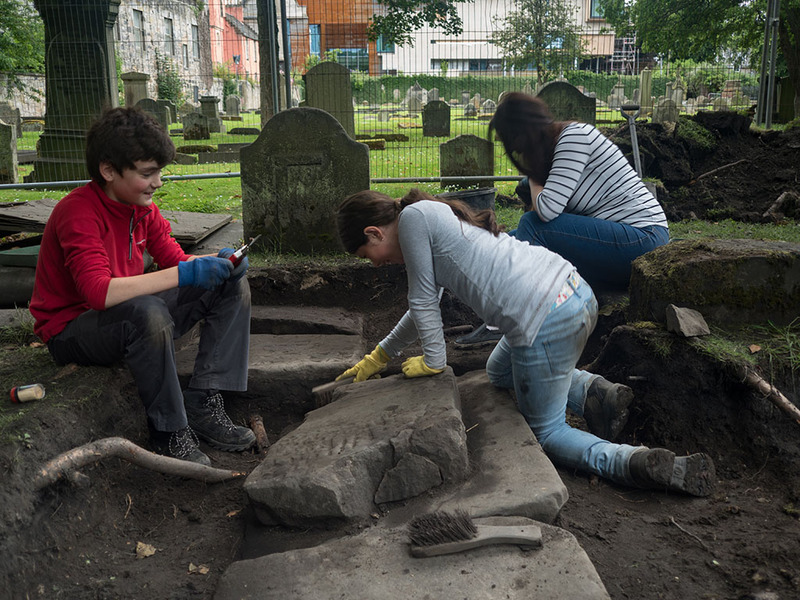 People tend to be amazed that so many gravestones lie hidden; pleased that we are finding them again; heartened that young folk are involved in such an exciting project and disappointed that we have to cover all the stones again at the end of the dig. 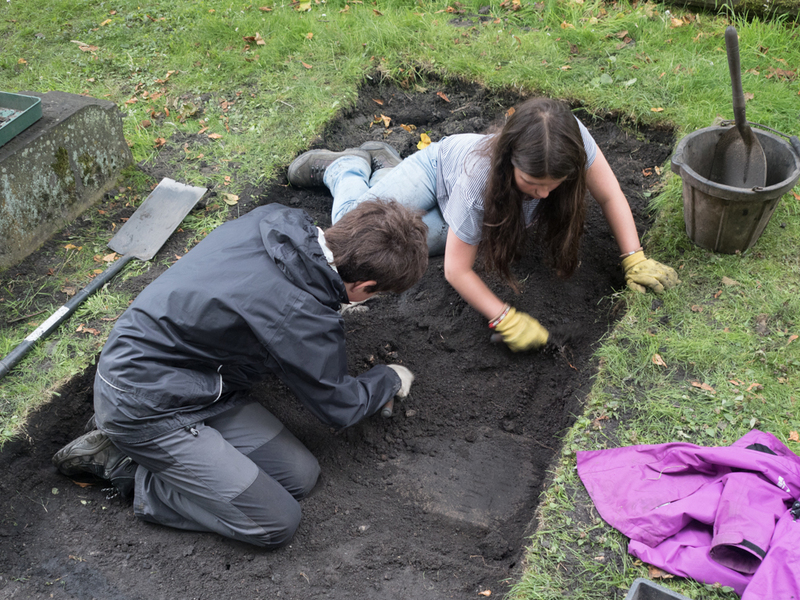 For the second day in a row a YAC member had their first go at excavating, this time Olivia. She made an excellent start and was quick to realise that almost every single thing we find is in fact a rubbishy bit of sandstone. Anyway, the photos below give a view of what we have found so far this season. We think that all of the stones were dumped when the ground was levelled in the 1920’s. None seem to be in their original position. 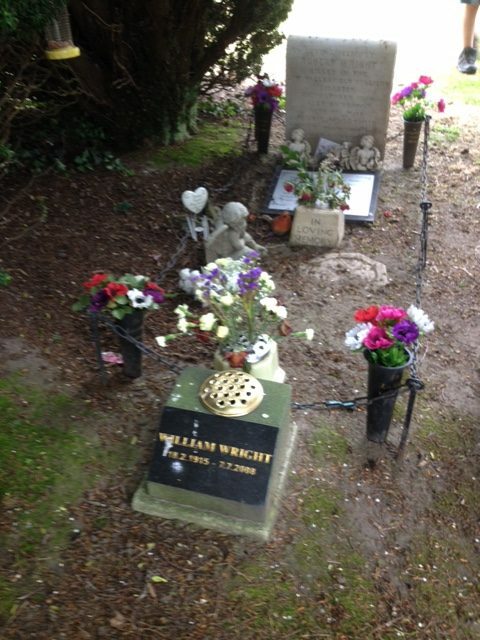 Notice the gravestone at bottom left. This has a worn coat-of-arms on it. It got very muddy on Friday and will need a good cleaning to reveal the inscription properly. We need to uncover the base of the stone first. 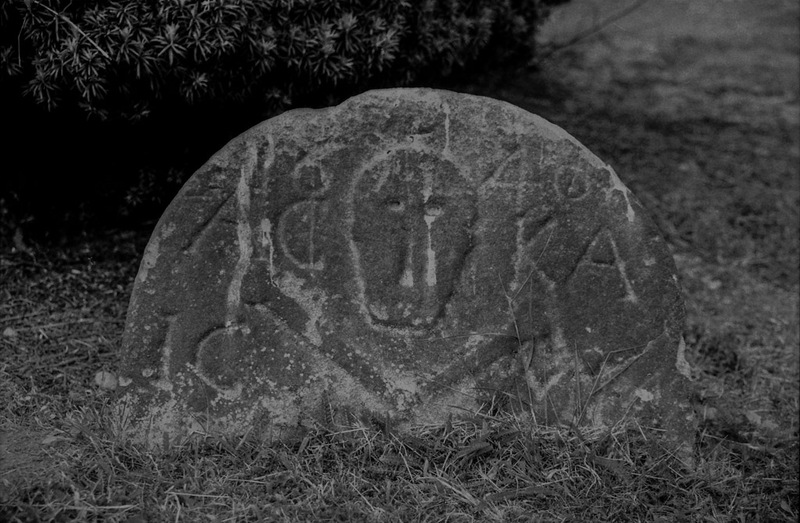 Robert Anderson’s stone is just about legible still, though some of the lighter strokes of letters are worn away. We have found no trace of any more inscription further down the stone. 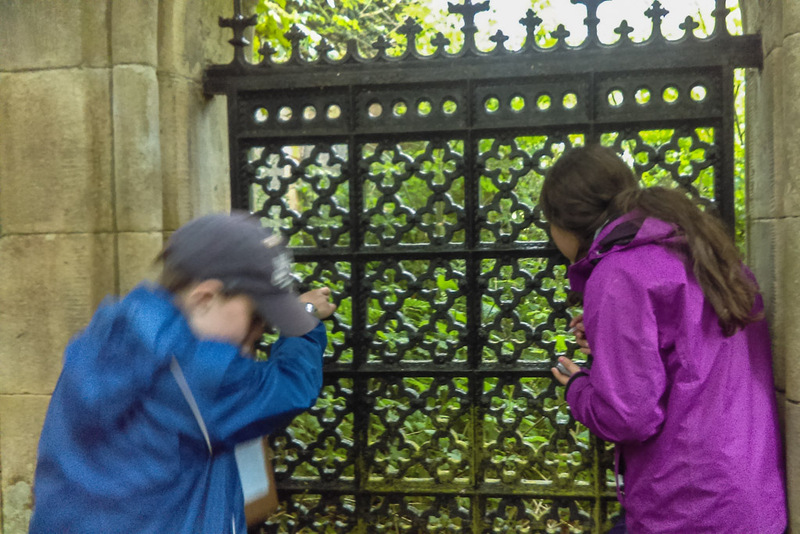 Sue Mowat suspects that the stone was originally sited several metres from its current position. 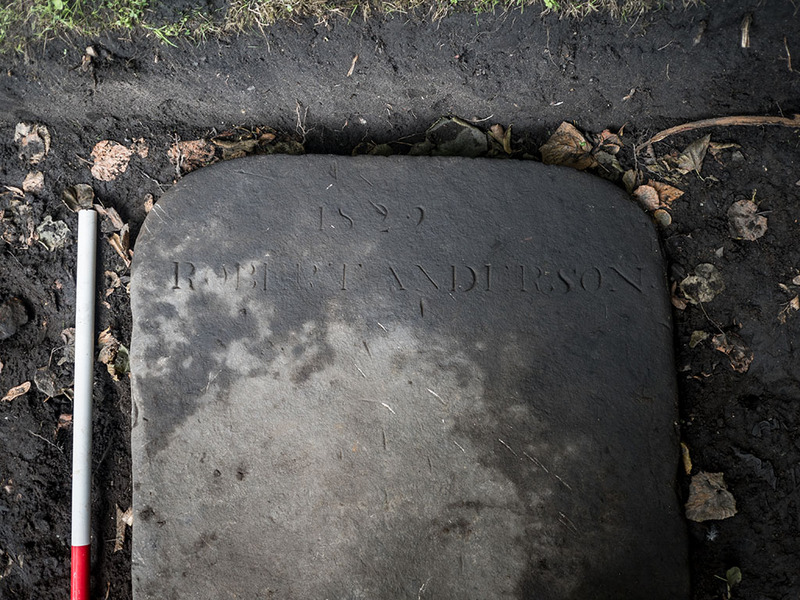 Robert Anderson’s gravestone. Can you make out the date? This is the broken stone cleaned up by Dougie and Erin, muddied by Alexander, Kathryn and Lee and then cleaned again by Alexander. 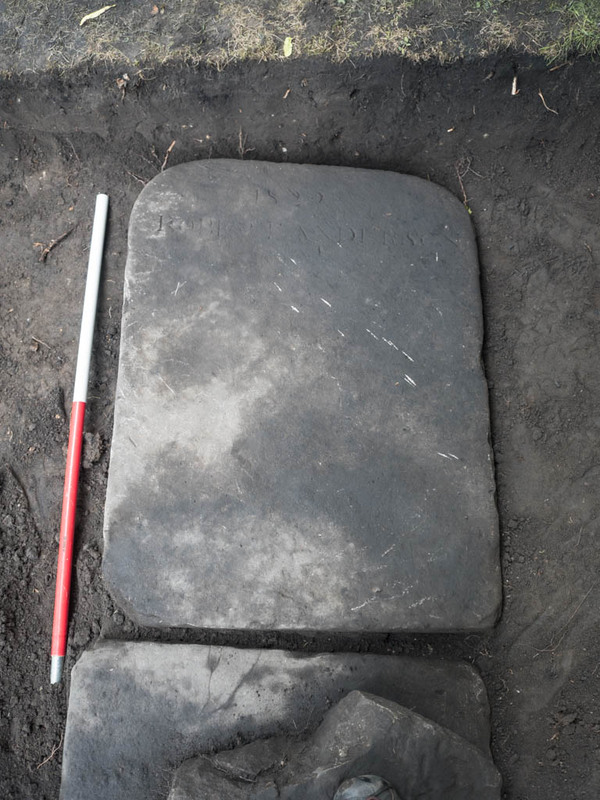 The crescent-shaped tool with a block-handle underneath is a tool used by shoemakers to cut leather and is found quite commonly on 17th and 18th century gravestones (see the previous post on our visit to Culross. The flowers at the top of the stone and other symbols are rather more unusual. Hopefully the stone will have a chance to dry off properly so that we can give it a good clean. 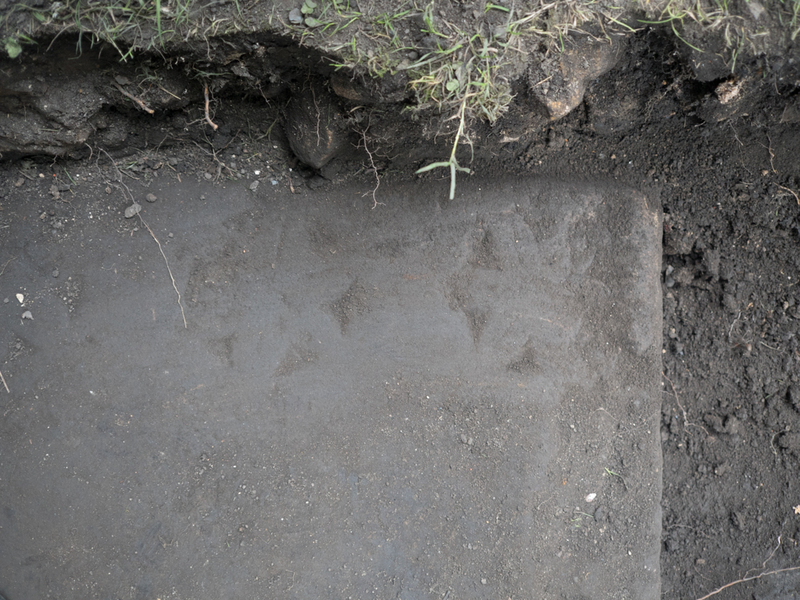 The fragment of stone below the shoemaker’s stone is still partly under the turf. 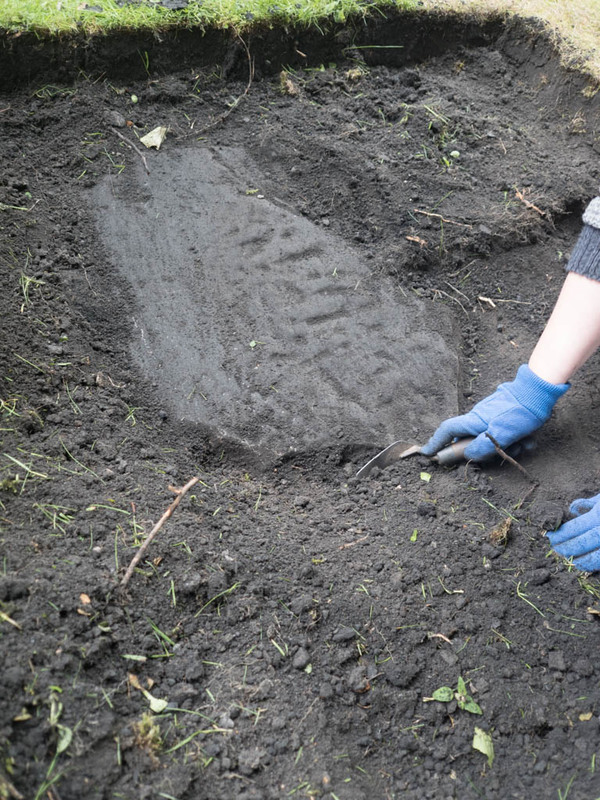 We will finish uncovering it and then have a look for inscriptions during the next session in the graveyard. There were only four of us on site today: Alfie, Alexander, me and “Mr Bucket”, Algirdas. 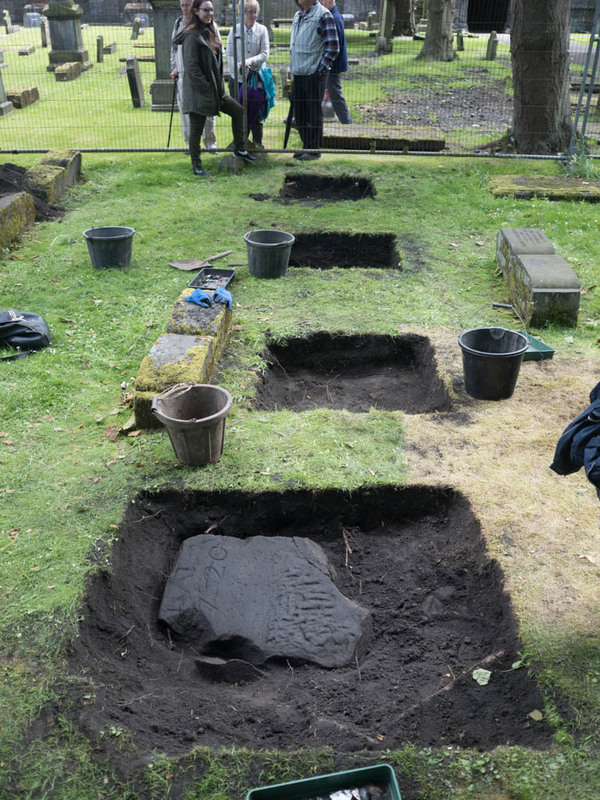 That said the members got a huge amount of work done, fully exposing yesterday’s discoveries, and then, right at the last moment, finding the corner of another gravestone, to take the YAC total up to four and the site total to six. A rare photograph of Algirdas not posing! Alexander arrived first and got stuck in. He worked very hard throughout the session and I should imagine will sleep well tonight. Algirdas wore himself out carrying buckets of earth to the spoil heap. He made some rather fine mud pies though. The photograph below gives an idea of just how much earth members shifted today. Just before we packed up Alfie decided to probe for stones lower down and hit a possible stone that lies beneath the three we have uncovered so far. Interestingly it was only as we cleared the sides of the lower stones that we got onto the layer of rubble put down in 1927 that characterised last year’s dig. This suggests that there might well be more to find further down. Alfie came across yet another recumbent gravestone just as we were finishing. It seems to have been squeezed into quite a tight space. It will be interesting to see if it is actually in its original position. 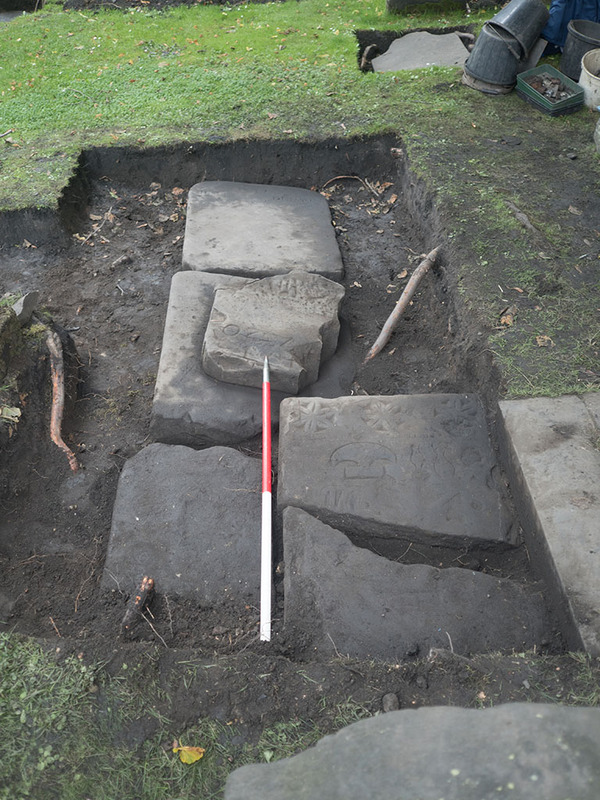 Both the stones we found yesterday appear to have originally been standing and were perhaps laid where they now lie as part of the levelling work done in the 1920’s. Finding an inscription on a stone is always exciting and no doubt Sue Mowat, the local historian who leads the project, will soon tell us exactly who My Anderson was. It maybe that more of the inscription survives below the “&” so we will give the stone a good clean with brushes and toothpicks to pick out the lettering. We will lift the 18th century stone at some point, to see if there is an inscription on the stone beneath. Today the team was made up of Sienna, her brother Kerr, mum Claire, myself and William. Sienna, being an old hand, took charge of introducing her brother and mother to the art of trowelling. 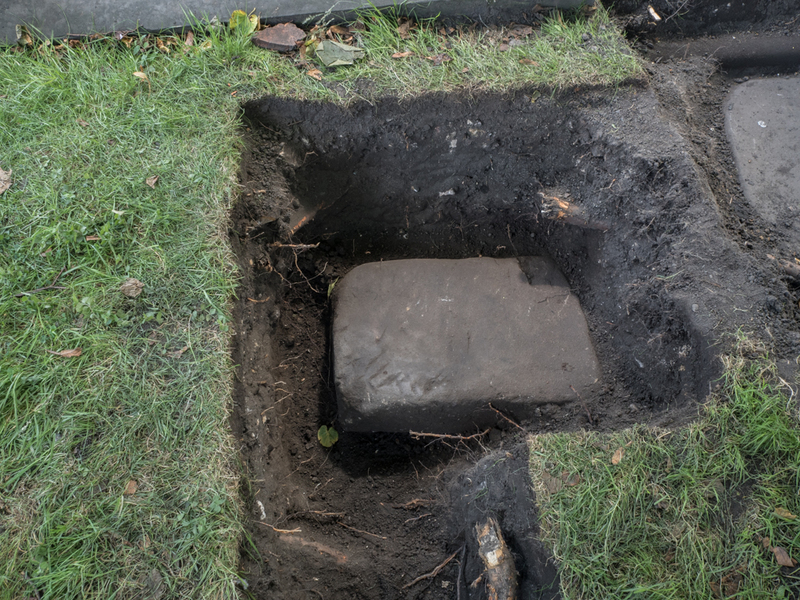 Asked to clean around the stone we found yesterday, the McLaughlin three soon came down onto another two gravestones, one lying beneath the broken 18th century gravestone. We didn’t have time to reveal much of the new stones, but extended the trench boundaries so that more can be uncovered tomorrow. 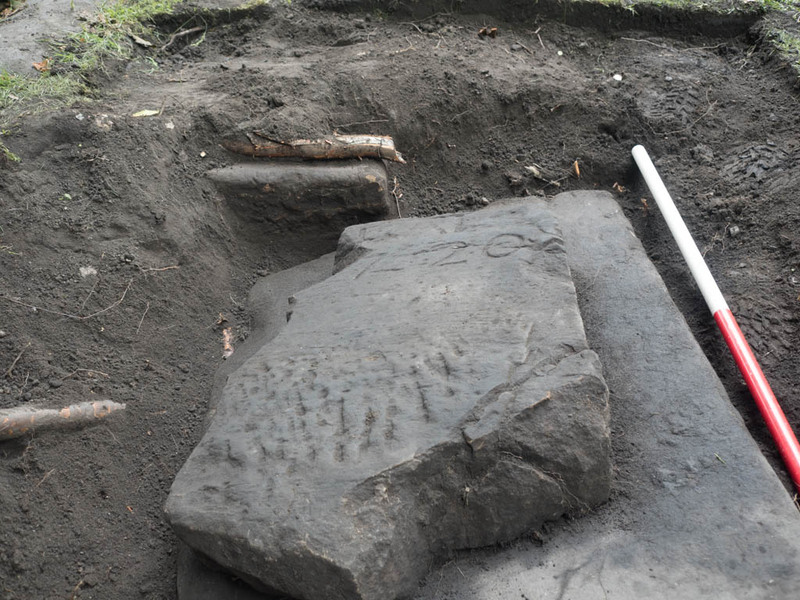 Let’s hope that we find legible inscriptions. At the very least we should be able to tell if the new stones are still in their original positions. 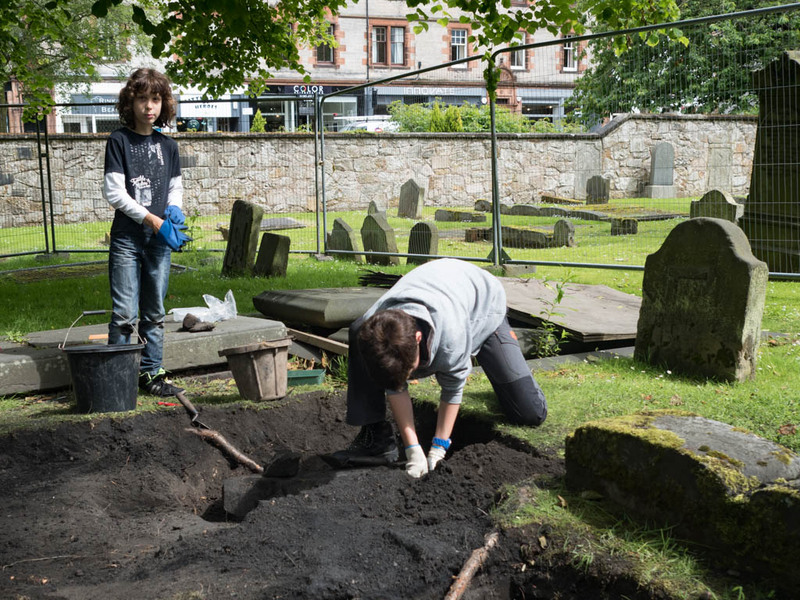 Well, it’s that time of year again, when minds turn to thoughts of holidays by the sea, lazy sunny days in the park and, of course, digging in graveyards for lost gravestones. 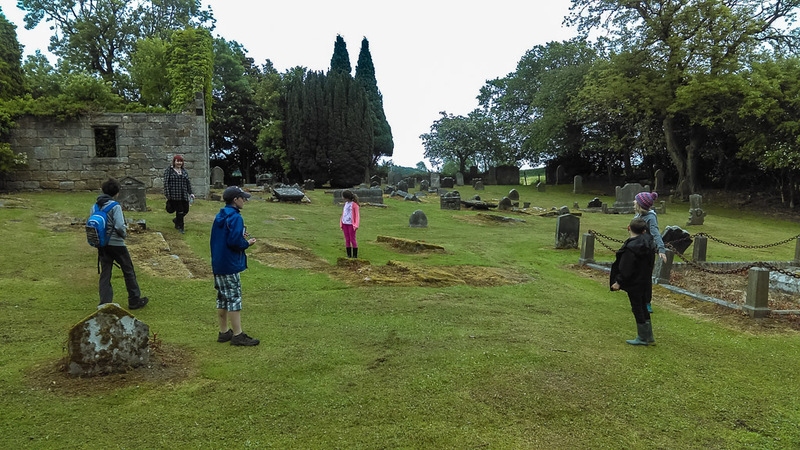 Dunfermline YAC members started their summer odysseys today with a few hours in the graveyard. As you can see, DHCP beat us to the first gravestones. There is one just under the tree and another at the end of the trench in the left of the picture. This year we decided to start with a row of 1m x 1m test pits along a line that we might expect hidden stones to lie, as you can see in the photograph below. As last year, the top soil consists of dumped material that includes stone, brick, and more domestic waste. Each of the test pits quickly produced small finds such as fragments of clay tobacco pipes, decorated glass and pottery. Algirdas was the only YAC member with experience from last year’s dig, but everyone worked hard and made good progress. 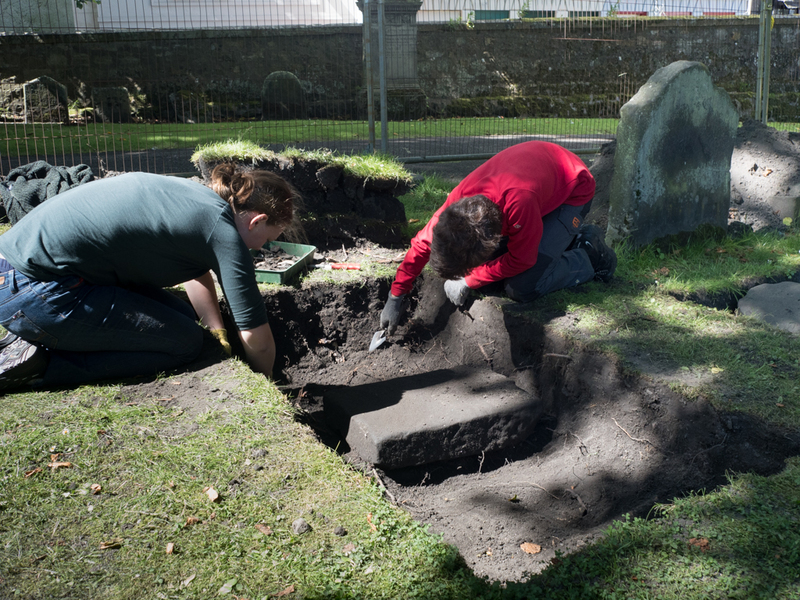 It was mother and son team, Fraser and Lesley who got lucky today and found the first YAC gravestone of the season. 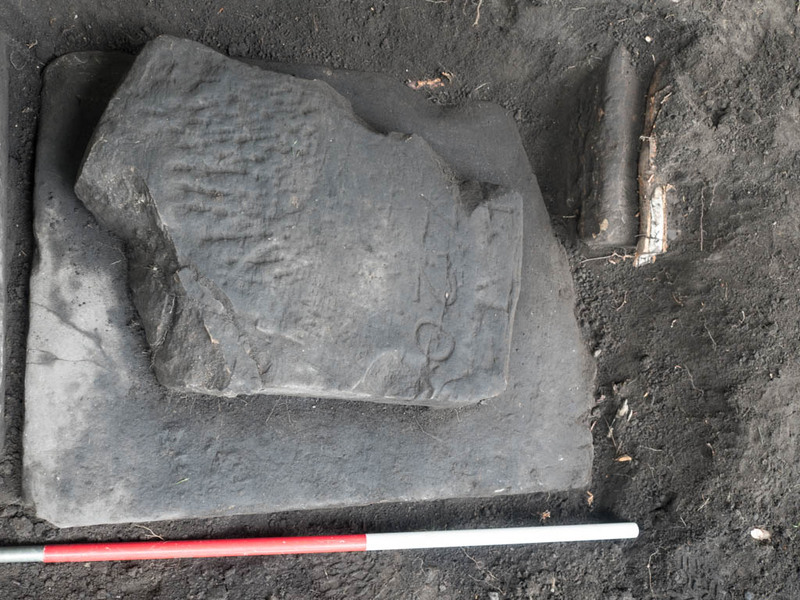 Unlike last year, where we uncovered 19th century slabs, lying in their original positions, today’s find was a broken early 18th century stone that had been used as infill when the ground was levelled in the 1920’s. 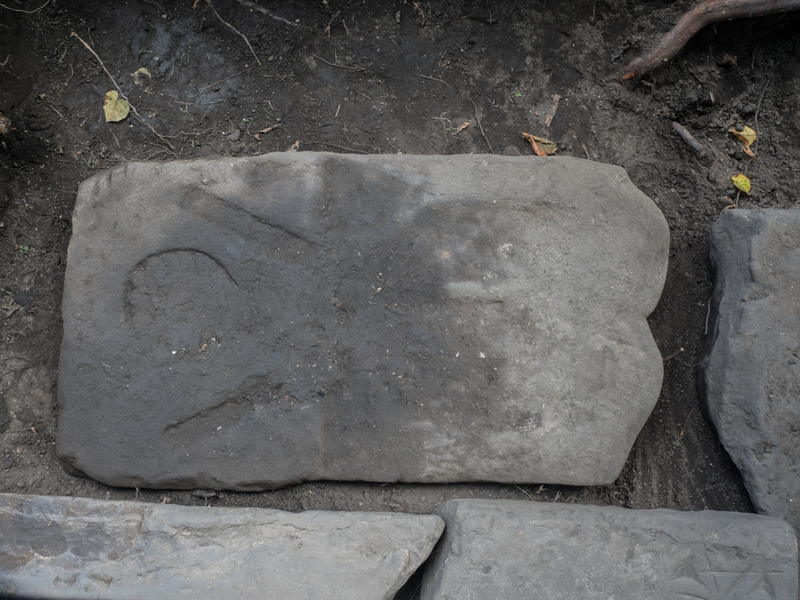 Is this the first gravestone of the dig? The stone has clearly broken as it was dropped into place. 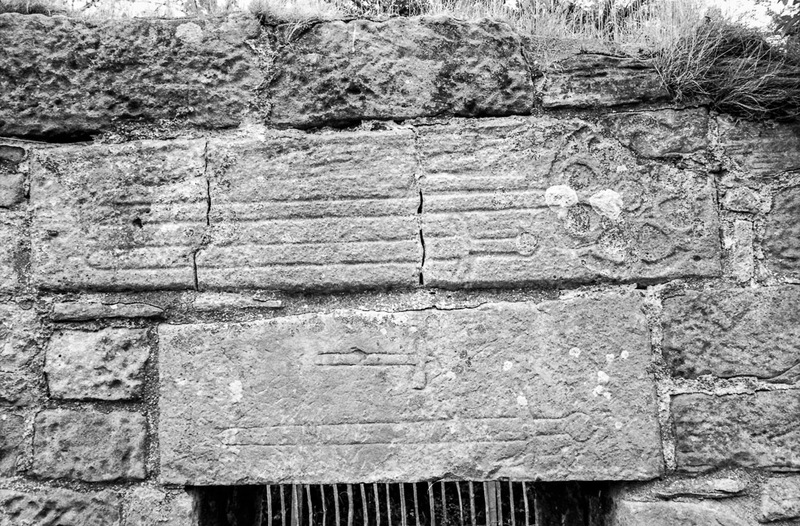 We shall determine whether there is another stone beneath this one and also see if we can make the initials in the inscription any clearer. 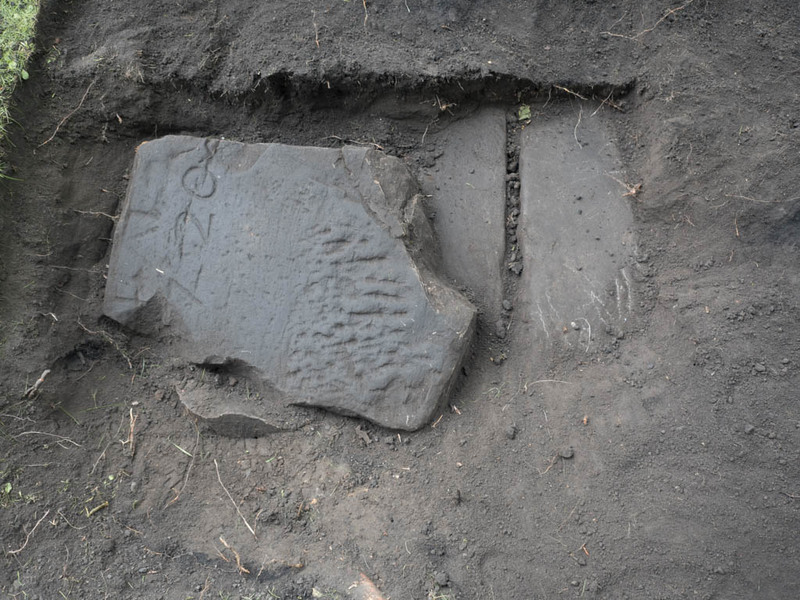 It is the first gravestone of the dig! On Saturday 11th of June Dunfermline YAC descended on the unsuspecting, sleepy Fife village of Culross, hit it hard and sent it reeling. Well, we were a bit noisy some of the time and there were quite a few of us. Some tourists stared a bit. Culross Palace. It isn’t a palace, it was the home of coalmine owner, Sir George Bruce. 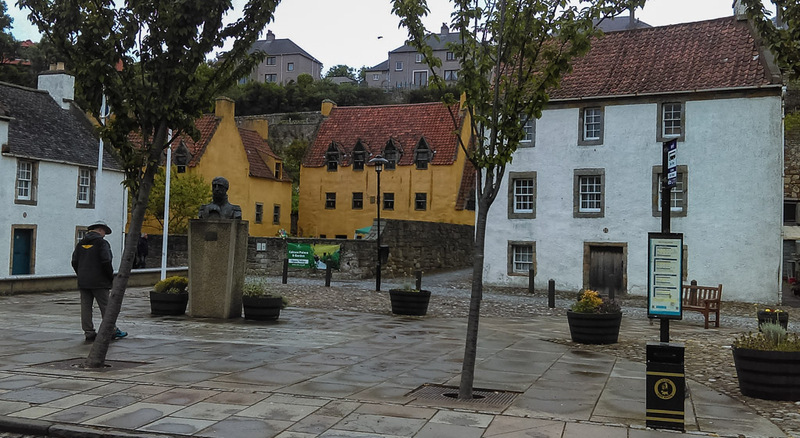 We strode, without hesitation, right up Culross’ Back Causeway and on to the Abbey, a Cistercian establishment founded in the early 13th century by the Earl of Fife. 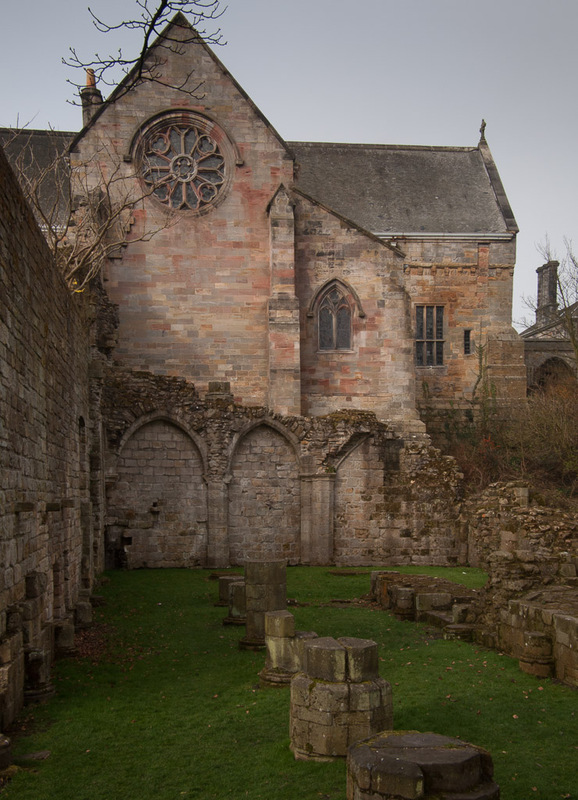 The monastery has been in ruins since the Reformation, but the Abbey church remains largely intact, having been taken over by the burghers of Culross as their parish church. 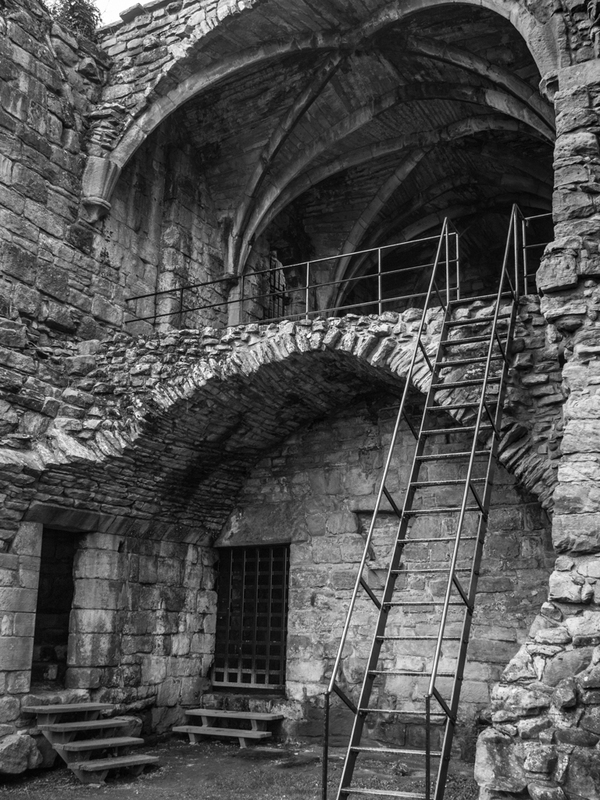 Although the monastery attached to the abbey is in a ruinous state, there is still a lot to see. Above all, the ruins helped us to appreciate the challenges faced in building a monastery onto the side of the steep hill we had just struggled up. Almost the entire line of smiling YAC members ran off just as Charlotte took this photo. A clearer view of the massive undercroft needed to keep the upper floors of the monastery on the same level. After finding an exciting back-way round to the graveyard, we spent a long time looking at the gravestones. 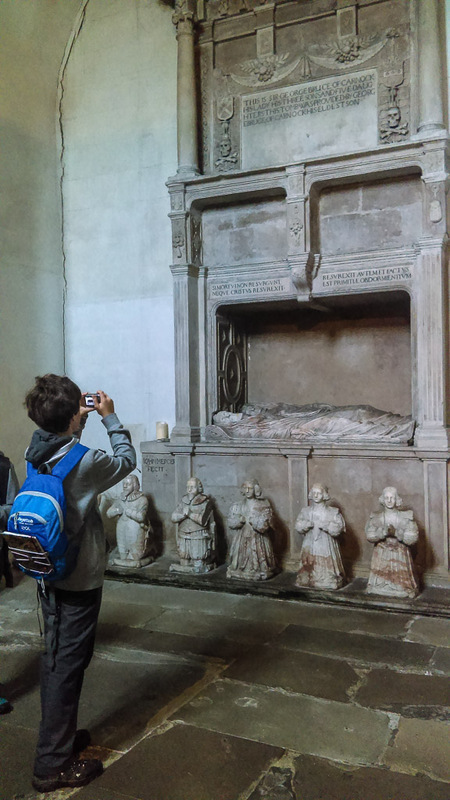 Some of the older stones, from the 17th and 18th centuries, include engraved pictures intended to remind us the shortness of life and to tell us something about the person buried beneath the stone. This one includes an engraving of part of a plough which tells us that H.I.W. was a farmer. 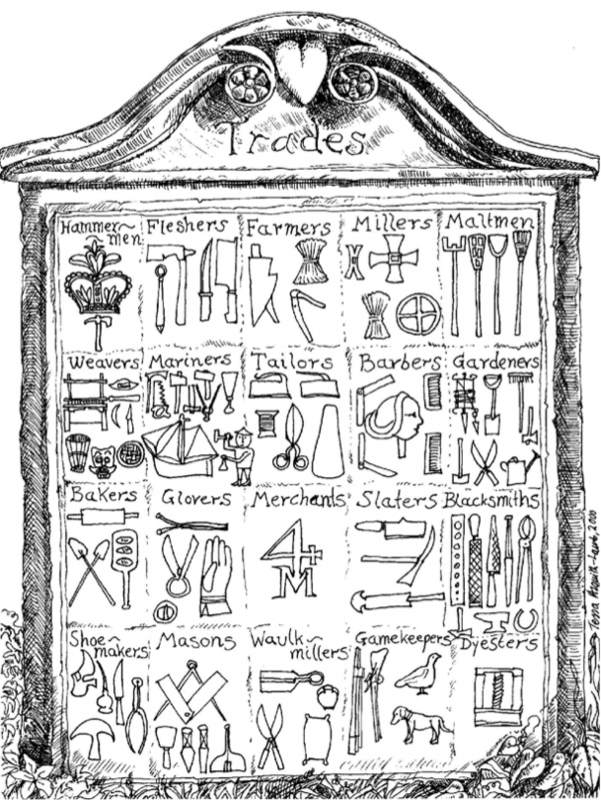 Every trade had its own symbols, usually pictures of their tools, as you can see from the illustrations below. However, the most spectacular grave we saw was inside the Abbey iteself. 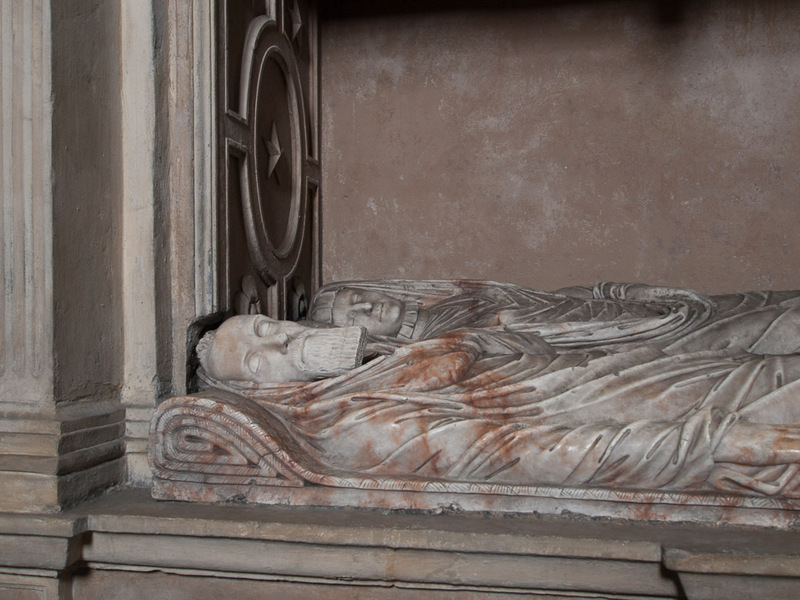 The tomb of George Bruce, he of palace fame, and his wife Margaret is quite spectacular. He clearly believed in being remembered in a grand style, with all the children at his feet, praying for their parents’ souls. Alexander records the Bruce memorial for posterity. 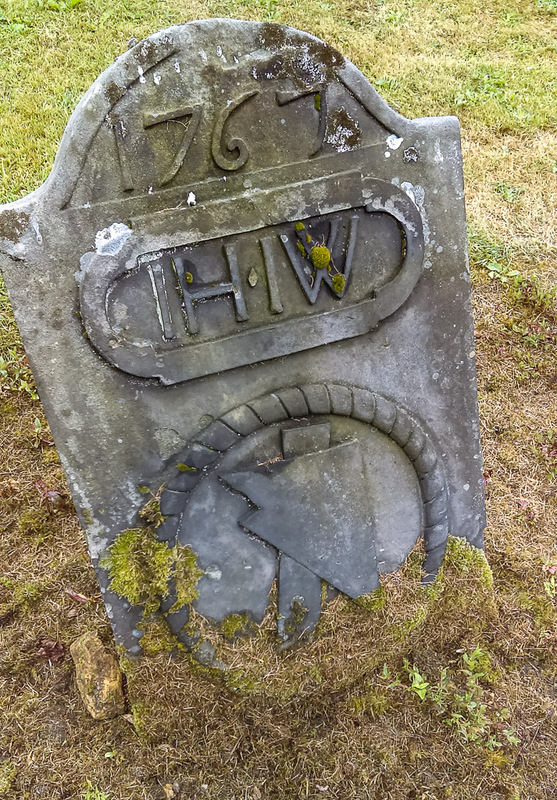 Eager for more gravestones, and lunch, we plodded off to the ruin of the old, medieval West Kirk and the graveyard that once served both Culross and the neighbouring burgh of Kincardine. 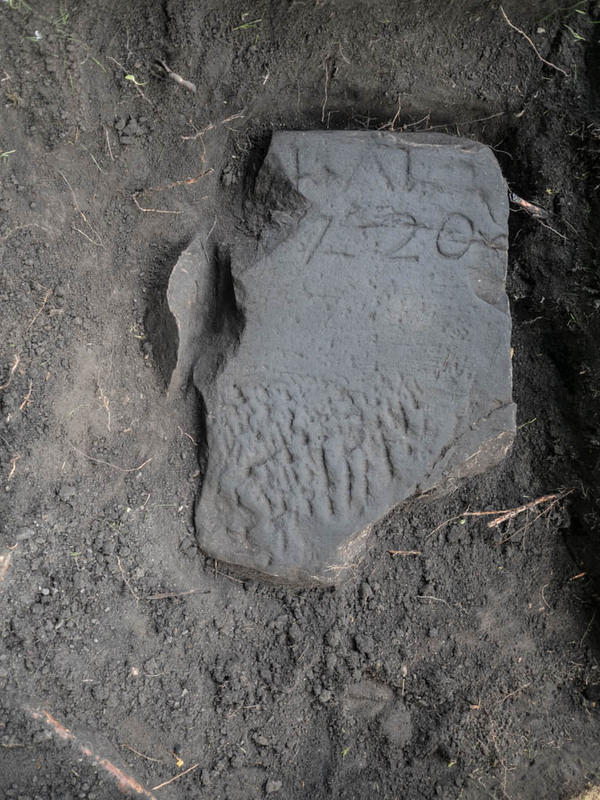 We spent a long time hunting for the oldest dated gravestone, but for the life of me I can’t remember how old it was, or who found it. It was definitely early 17th century, probably. 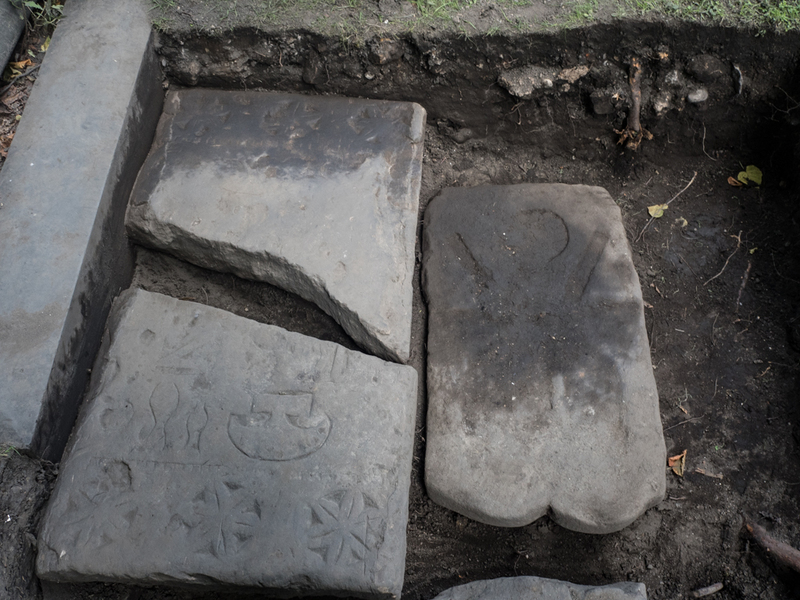 The oldest gravestones of all were medieval slabs that had been reused as lintel stones in the ruined church. If you look carefully, you can make out the swords engraved onto the stones. Clearly they once marked the graves of men who wished to be remembered as wielders of sharp, pointy objects. 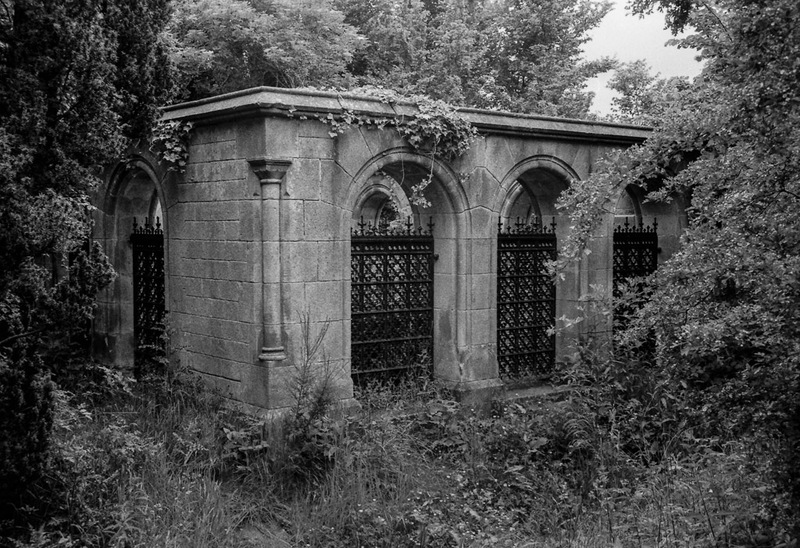 The creepiest part of the graveyard is the Dalgleish Mausoleum, covered in brambles and ivy, it is almost impenetrable in the summer months. Quite a good place for a sleeping beauty to snooze undisturbed. There were a good many 17th and 18th century stones with engravings, but the grave that made the biggest impression on us (which luckily Sienna photographed), commemorates a victim of the High Valleyfield Mining disaster of 1939, when 35 men lost their lives in an underground explosion. 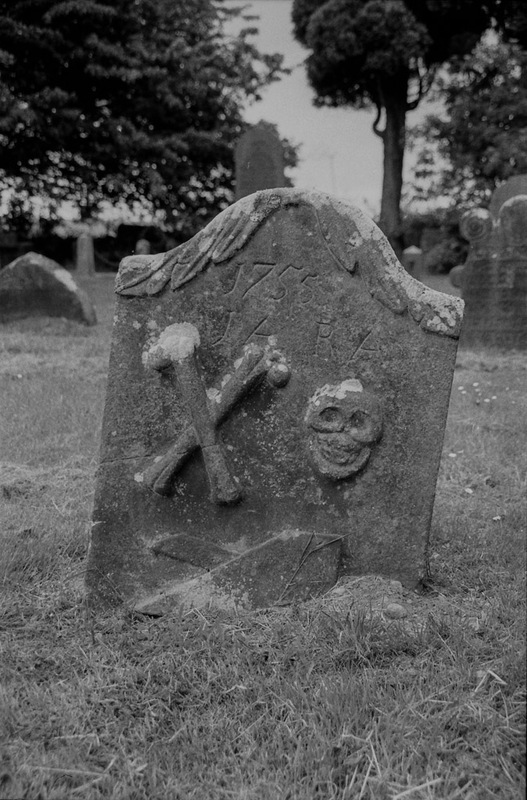 A gravestone with symbols of mortality: bones and skull; as well as a farmer’s plough. 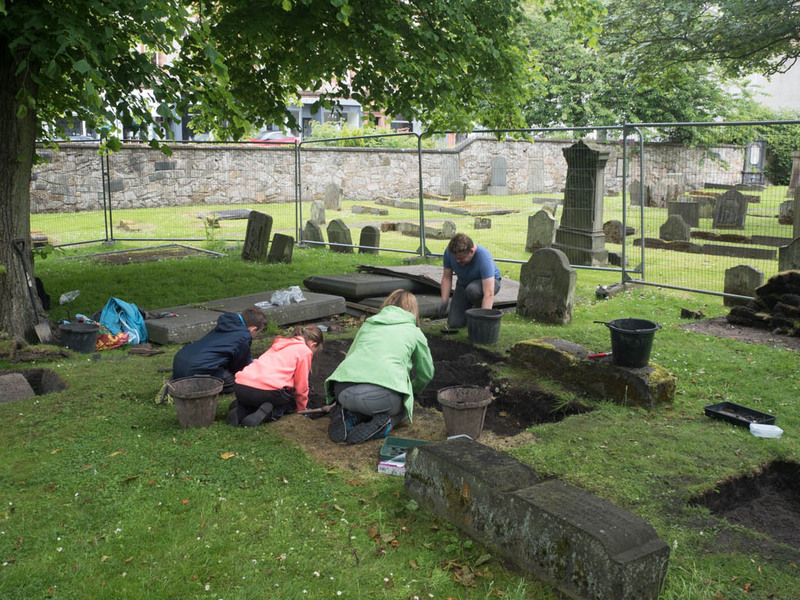 Well, all those gravestones certainly got us into just the right mood for the summer dig in Dunfermline Abbey graveyard, hunting for buried gravestones. Hopefully we will have a bit better understanding of any stones we find and some appreciation of the those whose graves they marked.